Description: Hosted at the Knights of Columbus Hall in Decatur. Music is provided by 90’s Daughter. Food is by Mac’s Pigskin Diner. Tickets $65 each or table of 10 for $600. All are welcome! Description: Please pray for the youth of our parish as they become Confirmed at the Cathedral of the Immaculate Conception in Springfield. You are welcome join us for this celebration. Description: Those who have experienced the loss of a loved one often find healing and support through sharing with others who have similar experiences. This grief session is at the parish house at St. James. Anyone is welcome to attend. For more information, contact Donna at 422-4534. Description: Join us for food and fellowship at the Knights of Columbus Hall. Description: Meet in the St. James Parish House dining room. The first book of 2019 is 'The Extraordinary Life of Sam Hell' by Arthur Robert Dugoni. You are welcome to join us. Description: All Extraordinary Ministers and Lectors will gather for an evening of reflection in the St. James Parish House. Dinner will be served. 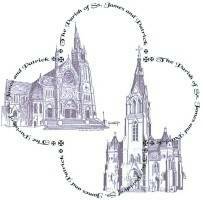 Description: All Mass musicians will gather for an evening of reflection in the St. James Parish House. Dinner will be served. Description: Those who have experienced the loss of a loved one often find healing and support through sharing with others who have similar experiences. This grief session is at the parish house at St. James. Anyone is welcome to attend. Description: Hosted at Applebee’s Grill. Call James Vogel at 217 429-2089 with questions. Description: Tickets are being sold after all the weekend Masses, or you can reserve them by calling the school office: 423-4351. Hosted at the Knights of Columbus Hall. Join us for this evening of fun to support our parish school! Hosted at the Knights of Columbus Hall in Decatur. Music is provided by 90’s Daughter. Food is by Mac’s Pigskin Diner. Tickets $65 each or table of 10 for $600. All are welcome! Please pray for the youth of our parish as they become Confirmed at the Cathedral of the Immaculate Conception in Springfield. You are welcome join us for this celebration. Those who have experienced the loss of a loved one often find healing and support through sharing with others who have similar experiences. This grief session is at the parish house at St. James. Anyone is welcome to attend. For more information, contact Donna at 422-4534. Join us for food and fellowship at the Knights of Columbus Hall. Meet in the St. James Parish House dining room. The first book of 2019 is 'The Extraordinary Life of Sam Hell' by Arthur Robert Dugoni. You are welcome to join us. All Extraordinary Ministers and Lectors will gather for an evening of reflection in the St. James Parish House. Dinner will be served. All Mass musicians will gather for an evening of reflection in the St. James Parish House. Dinner will be served. Those who have experienced the loss of a loved one often find healing and support through sharing with others who have similar experiences. This grief session is at the parish house at St. James. Anyone is welcome to attend. Hosted at Applebee’s Grill. Call James Vogel at 217 429-2089 with questions. Tickets are being sold after all the weekend Masses, or you can reserve them by calling the school office: 423-4351. Hosted at the Knights of Columbus Hall. Join us for this evening of fun to support our parish school!